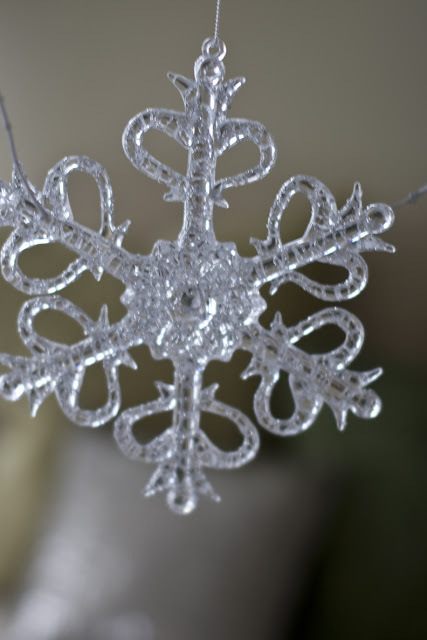 As I've mentioned I'm crazy for the classic style of Matthew Mead and beyond honored to be included in his holiday magazine along with other wonderful bloggers like Centsational Girl and Savour Fare as well. If you haven't already, order your expanded keepsake copy now! Matthew stopped by last week to share a fabulous DIY Sweet or Sour wreath and he is back today with 5 tips on styling your living room for the holidays. Welcome back, Matthew. A color makeover for the holidays can transform your home into a cohesive and calming interior that is festive and stylish but won't "break the bank." In our home, our autumn look was infused with a strong sense of orange, but for Christmas we were inspired by natural shades of evergreen. A quick change of pillows, some fresh elements, pottery, and a cozy throw instantly transform the space with a soft and comforting wintry palette. 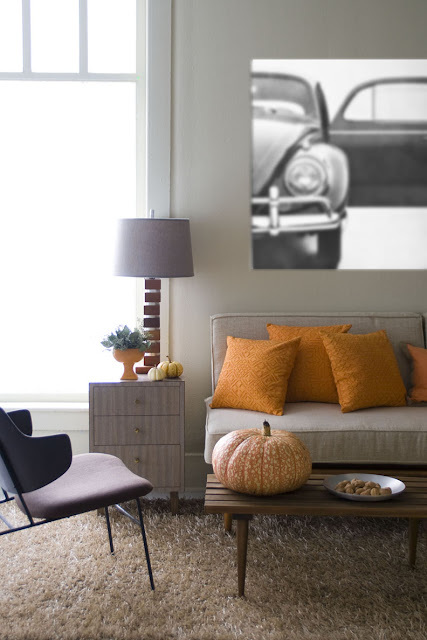 Shop discount home furnishings stores for inspiration. 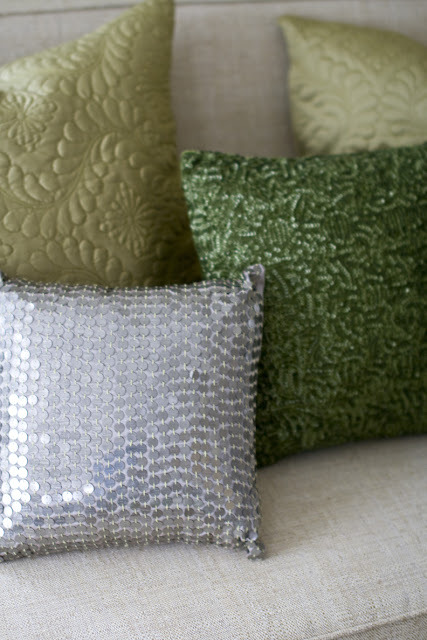 Pillows are often nicely organized in color collections in most stores, so for under fifty dollars I found a mix and match of textural and embossed pillow patterns. Evergreens can be gathered from outside or from a garden center or greens market - for little or no money - and added throughout the home in both arrangements and wreaths. Items from around the house (like these platters and pottery pieces, above) can be brought in to reinforce the color palette or pressed into service as simple centerpieces for the coffee table. Greens for the holiday are a natural choice. 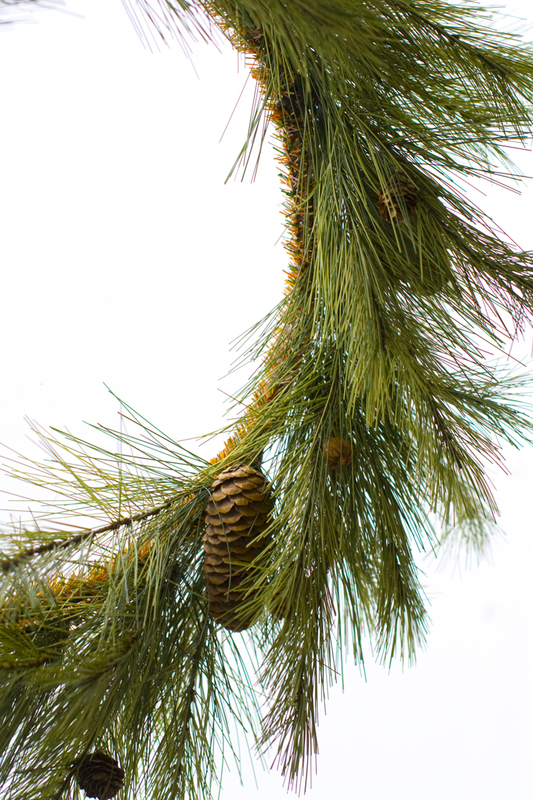 My wife, Jenny, and I visited a tree stand and found a Scotch pine wreath in an updated shade of green. That green became the foundation for selecting the textiles for the room- I looked for shades and hues within the same color family to create gradient colors that mixed and matched nicely. 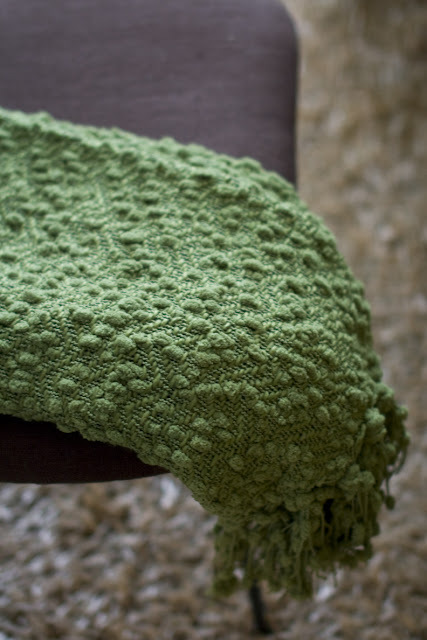 A throw always adds softness and warmth and is a reminder of the season and the comforts we crave. Fabrics with multiple textures and patterns are interesting. I like to focus on items that have a tactile surface to add dimension and design to the space. I chose a golden Cyprus tree that is not only fragrant, but is also an iconic symbol of Christmas to dress up a side table. 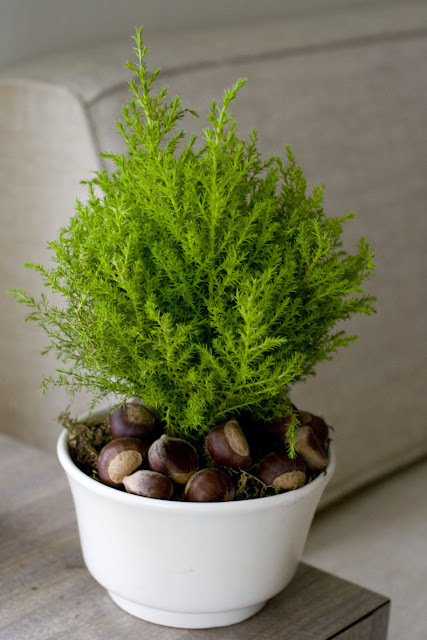 Evergreens like boxwood, juniper and Norfolk pine are mixed greens that relate to the colors in the room and infuse any space with the fragrance of the season. 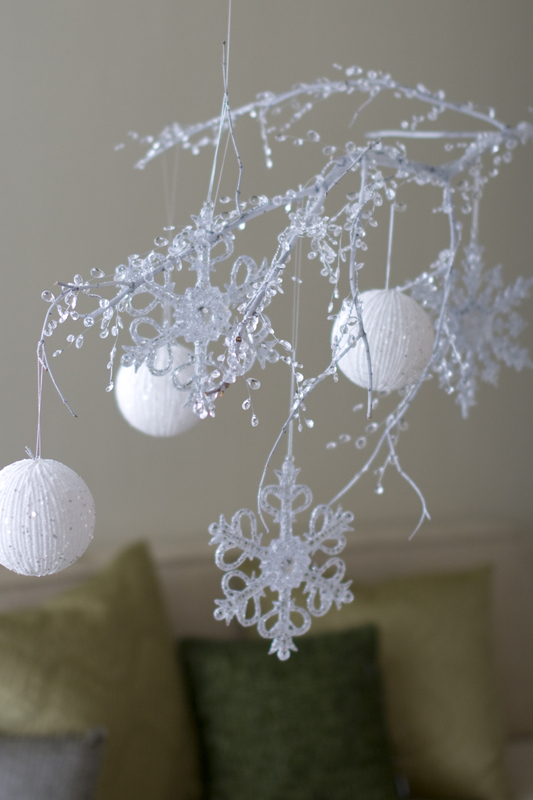 A show-stopping way to impress your guests is with this ornament-adorned hanging branch. 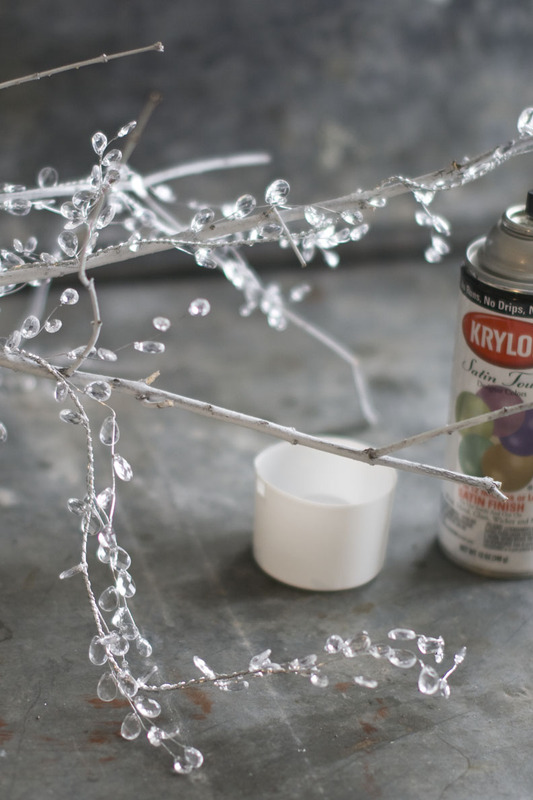 I simply cut a bare branch from outside, lightly sprayed it with white paint, and then wrapped it with crystal garland from Michael's crafts store. To hang, attach monofilament wire to the branch and suspend it from the ceiling using small hooks. Adorn with white and silver ornaments and crystalline snowflakes (found at a florist shop or craft store). Try an elongated white platter - like this one I found in our kitchen pantry - to create a coffee table centerpiece. 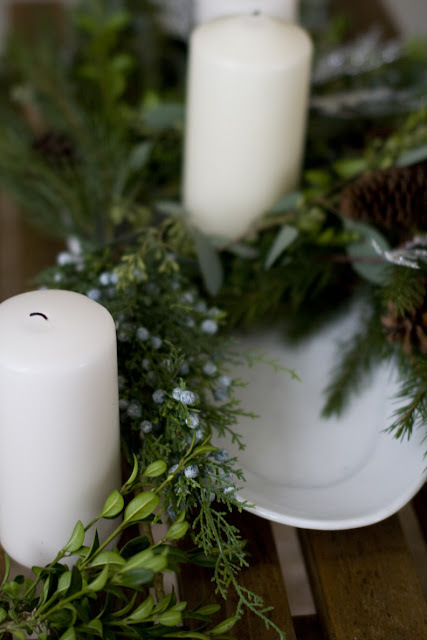 Simply arrange candles on the platter and festoon with small sprigs of mixed evergreens. Great ideas! I love the little cypress tree.....so cute! 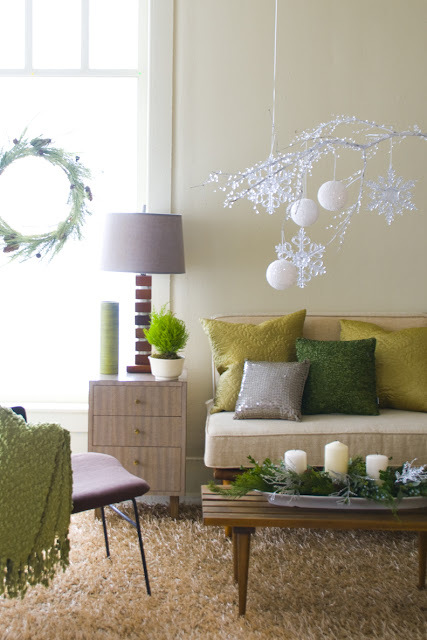 Love decorating with natural shades and boughs! I love how you did this! Beautiful! I love the simplicity of using lots of things from nature and that gorgeous branch hanging overhead. A touch of holiday without being over done. Totally my thing. You have the touch! Such fun ideas. Love this posts! Thanks for the tips! Your living room is absolutely beautiful and I love your changes for the seasons! Great ideas! Such simple and easy things to do, but they have such massive imact! I'm going to try some of these ideas tonight!